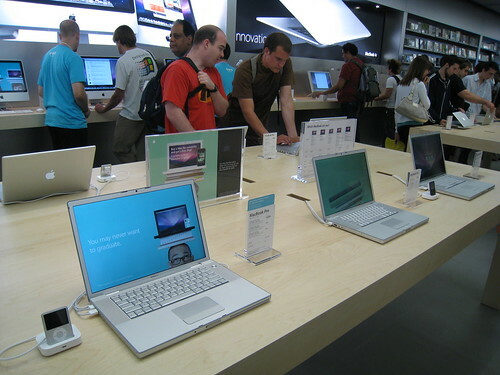 When the Rideau Centre Apple Store opened in Ottawa, it was a quiet revolution for Mac and iPod fans. Finally they would have a place to go and worship their favourite consumer electronics. And it was a brand marketing home run for the Cupertino juggernaut. But more than a place for nerds to drool over glossy 27-inch screens and the latest multi-touch devices, Apple stores, especially the one in Ottawa, represent a larger strategy for a company that can often seem based in the distant lands of California and the Internet. And it’s a strategy many online-only companies can learn from. Give your company a location. Even in today’s digital economy, where many businesses are internet-based, giving your company a physical location can increase consumer trust and loyalty. Unlike your website, they can depend on your store, warehouse, or home-office being there tomorrow. List address information, or, better yet, include a photo of where you work on your website. Make it shiny. Even if your store is small, it’s got to be eye-catching (that goes for your website too). People wander into the Ottawa Apple store all day long because of its unique layout; bright, open design concept, and grand, all-glass storefront. Potential customers will spend more time on your website if it’s visually appealing. Don’t be afraid to sell your own product. If it’s good enough for the Internet, it’s good enough for the streets of Ottawa. One of the reasons Apple opened its retail chain was because it felt other retail businesses were not doing a good enough job of highlighting its products. If you believe your product or service isn’t getting the recognition it deserves, stepping outside the confines of the Internet can increase your product visibility. Educate everyone. Sometimes it seems like Ottawa Apple store employees are simply there to promote products they believe in—the sale comes later. This ‘soft sell’ can educate customers about your products or services and implant positive selling points in their minds that they will recall later. This is, of course, a simplified version of just some of the techniques that Apple retail stores employ and no one seems to be doing it better. Incorporating all or just some of these tips into your online business can increase consumer trust and loyalty, and improve brand recognition.